I want to write a bit about my favorite Standard deck – a deck dedicated to smashing with big monsters. I played it at Regionals, and while it is arguably just below Tier One, I am going to Nationals. My deck is way more fun than Pickles, and beats most of the Tier One decks fairly consistently. I’m talking about Glittering Wish Control. The concept of the deck is fairly simple: play a lot of targeted removal, a bunch of Wrath effects, solid discard, excellent card drawing and a tutor / toolbox. In short, lots of good stuff. I have been evolving the deck for a while. My original build was patterned after one Evan Erwin played at a StarCity Games tourney. I tweaked it some, following some suggestions from Josh Silvestri. Here’s the version I played at Regionals. This version worked, but it has a few problems. First of all, it is extremely mana heavy, and while it does hit its land drops, it tends to get flooded in the late game. Sometimes you draw out of that, and sometimes you don’t. It also has one or two strange card choices. Orzhov Pontiff is fine at killing an opponent’s x/1s, but it should have been Crime // Punishment. I just didn’t have one available. The Church of Deals was a replacement for a Vitu-Ghazi, and I’m not sure that was the right call, either. It won me a couple games, and does help pay for the life lost to Phyrexian Arena, but it cannot create chump blockers. One version of this deck did win a Regionals. Christopher Adams took first in Pittsburgh. Here’s his deck. A few quick comments on this deck, because I played a very close copy for a while. First of all, this is a bit slow. Glittering Wish is an excellent tutor, but it adds GW to the cost of whatever you tutor for. At best, that means your answer is going to cost five mana – and five color-intensive mana at that. The mana is better than my version, but not quite good enough. His deck also runs a full set of CoP: Black in the sideboard. I’m not sure what he expected to face that required that – probably Dredge with Svogthos, the Restless Tomb – but black does not seem like enough of a threat to justify the CoPs. The decks that do run black, like Mono-Black Rack, can kill with The Rack, which isn’t stopped by CoP Black. Mortify and Putrefy can also kill an animated Tomb. I have also noticed that, in nearly every case where it matters, I have the mana to produce Urza’s Factory tokens, instead of Saprolings off Vitu-Ghazi. Almost always – but there are some times when being able to play a spell, like Wrath, and still make a token EoT is an advantage. I have tried both, and still have 2 City-Trees in the deck. That changes on occasion. I am also still running my two Ravnica bounce lands. For every time I swear about the lack of speed, I have sworn much longer and louder about being color screwed. This deck is color intensive, and they do help. On rare occasions, they also help by removing your own Urborg, Tomb of Yawgmoth, which is important when playing against control decks with Tendrils. First of all, this is a control deck. You are rarely going to win quickly, with beat down. You are playing to win the long game. The most important principle is to strive for card advantage. Phyrexian Arena is probably the best card in the deck. I am very close to adding a fourth – but three seems about right. I have never sided out the Arena, even against burn or aggro. The cards in the deck are so good, you can beat anything, if you draw enough of them. Play the Arena. Wrath of God and Damnation are Wrath and Damnation. They are so very good. Against aggro, you have Wall of Roots to stop the bleeding and to force your opponent to over-commit. Once they drop enough creatures to flank the Wall, you can Wrath. You also have Loxodon Hierarch, which is insane against beats. The life gain helps with the Arenas, the power and toughness are both quite good, and they also force the over-commitment that sets up your Wraths. In the late game, Teneb begins recurring Hierarchs, and you opponents scoop. Against combo, you have Castigate and Persecute, and a lot of pinpoint removal. Your opponents usually need a god draw – or at least very good draw – to beat you. Against control, if you can stick an Arena, you have card advantage. 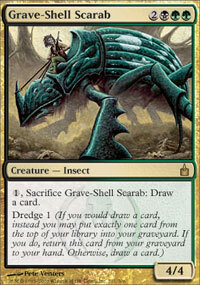 You also have a ton of must-counter cards, and Grave Shell Scarab is brutal. If yu just keep recurring him every turn, eventually your opponent will run out of counters. I have not run into Dragonstorm anywhere near as often as I should have, either at Regionals, in 8-man queues or in the practice rooms. I wish I could play against it more often. Even in game one, you have access to Hide //Seek. removing a Hellkite and gaining life really sets back their plans – and it gets worse when their dragons get Wrathed away. The key cards are Castigate and Persecute, which can mess up the combo, with Hierarch and Damnation in reserve. If you can get about 20 life, they usually cannot Dragonstorm for enough to combo-kill you, meaning that they have to wait until their next attack phase. A Wrath or Damnation during that wait is often game over. Against Dragonstorm, you want to side in the Castigate and the fourth Hierarch, since your first Wish will always get Hide // Seek. You can also bring in the Putrefy (for nailing dragons and Lotus Blooms during upkeep). The Sudden Deaths can some out, since only Tarox Bladewing dies to it. I also bring in the third Teneb for a Crime // Punishment, because C // P does very little. The only time I have lost this matchup is when I mistakenly cut Hide // Seek from the board. I’m not sure how I did that, but I wished turn three, leaving WB open, and it wasn’t in the sideboard. I still almost pulled it out. The UBw Mystical Teachings decks are very solid counterspell decks, but don’t be confused about your roll in this matchup. You are not the beatdown deck, here. You are the control deck in this matchup. Don’t worry about trying to race ahead to deal damage. Early on, you want to draw out counters by casting spells like Wall of Roots and Farseek – spells that further your mana. I also like to test-spell with Loxodon Hierarchs: if they resolve, great, if not, I nabbed a counter. 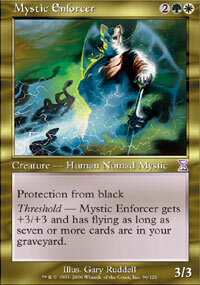 The spells I really want to resolve, in order, are Phyrexian Arena, Persecute and Castigate. Pyrexian Arena is everything – I often deliberately run Persecute into a counter, if it ensures that Arena resolves. Your first Glittering Wish will usually get Grave-Shell Scarab, which can eat counters better than nearly anything else. Provided you have extra mana, it can dodge Tendrils. 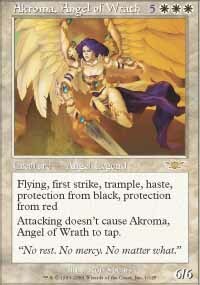 In the late game, I have often wished for Angel of Despair, and used it to kill and Urza’s Factory. 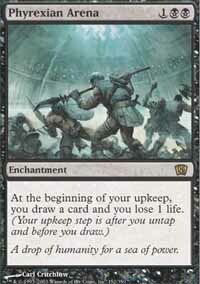 In other matches, Debtor’s Knell has been the backbreaker: they tap out to cast something, and you tutor for Knell. After that, you steal their Teferi and they just lose. For that matter, stealing a dead Teferi with Teneb is good times, too. Pickles is more a combo deck than a control deck. They do run counters, but their primary win comes from using Vesuvan Shapeshifter and Brine Elemental to prevent you from ever drawing additional cards. I have actually had more trouble with this deck than with Dralnu – but the matchup is winnable. It is just more random. You really want to kill the morphs in this matchup – specifically, you want to kill the Brine Elementals. However, since spotting the Brineys amongst all the other morphs is nearly impossible online, you have to kill them all. Sudden Death, Wrath, Damnation and targeted removal all nail Morphs, but beware of Willbender. Willbender can send even a Sudden Death someplace it does not want to be. Also be aware that a Vesuvan Shapeshifter can transform into a Wall of Roots – and that will also effectively fizzle a Sudden Death. All in all, your Walls of Roots are good only for mana acceleration – and bad after that. Use them for mana whenever practical, and let them die. Crime // Punishment is a mixed blessing in this matchup. If they are tapped out, you can kill a lot of Morphs for GB. If they are not tapped out, killing a Morph is nearly impossible: if you set X = 0, the unmorph and the creatures live. If you set X = something else, they leave them morphed and they live. Of course, Crime // Punishment can also steal creatures from their graveyard – but the best one to have is Brine Elemental, but having it in play allows them to use a Shapeshifter to lock you down. I bring in Last Gasps and the final Castigate. I usually take out a mix of Walls and split cards. I don’t know what’s better here – it feels like the secret to the match is not to stumble on mana or efficiency. The problem is that even if your wreck their hand, they can restock with cards like Foresee. At one time, I feared this deck enough to run four Leylines of the Void in the sideboard. However, I have seen this less and less often since then – and I have had no problem beating it when I do. The decks runs a series of draw a card / discard a card creatures that enable Dredge. These creatures have to die. They also run Bridge from Below, to generate a bunch of Zombies. However, Bridge from Below disappears when your creatures go to the graveyard. That makes Wall of Roots your best friend – especially when they help power out a Wrath. Loxodon Hierarch also kills himself, when necessary, to rid the graveyards of Bridges. Crime // Punishment also rocks in this matchup: I once stole an opponent’s Blazing Archon, then decked him. Punishment also kills zombie tokens cheaply. Later in the game, if necessary, resolving a Debtor’s Knell is good times. You bring in the Last Gasps and Putrefy for the Persecutes, which do nothing useful. Castigates can stay – they can often get rid of Dredge cards. Once again, you are just playing for the late game, when Teneb will sail over and pick through that tasty graveyard your opponent has built. The primary reason that I got rid of the Leylines was to fit answers to this deck. It tends to run (Augur of Skull)s, Call to the Netherworld, Smallpox, Mindlash Sliver, etc., plus The Rack and Phyrexian Totem as kill cards. The deck is amazingly good at killing hands, and it was giving me a lot of trouble. Dodecapods provide a partial answer – they at least stall the bleeding, giving me time to recover. As in so many other matches, Phyrexian Arena is the key to this matchup – but not if your opponent can nickel and dime you to death. The biggest sideboard card is Last Gasp, which can kill an Augur. I usually take out Castigates and / or Persecutes. WHile a turn three Persecute is brutal against a deck like this, Black Rack often empties its hand quickly making this sort of discard marginal. Vitu-Ghazi is often marginal, but it did save my but in a couple matches against Black Rack. The vast majority of Black Rack’s creatures die if chumped, so a source of infinite Saprolings is good. This matchup is highly in your favor. They have to win quickly, or Teneb starts getting Loxodon Hierarchs every turn and they can never burn you out. You bring in the Last Gasps against all aggro decks, and the combination of pinpoint removal, Wraths and life gain should shut them down. Castigates and Persecutes generally go out, because aggro decks tend to empty thier hands. Watchwolf is a 3/3 for two mana. In many matchups, it would be great to open with a turn two Wall of Roots, turn three wish for Watchwolf and cast it. However, Loxodon Hierarch is almost always better, and Wish into Watchwolf required WWGG. That’s hard to do – and if you have to wait a turn to cast the fetched creature, you could cast the Hierarch. 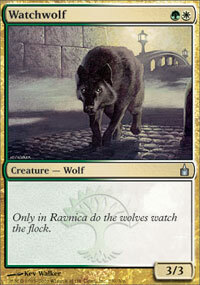 Watchwolf is good, but not good enough to steal one of those scarce 15 sideboard slots. 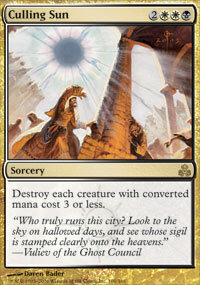 Culling Sun is more expensive than Wrath or Damnation, but it is the only tutorable Wrath effect around. However, Crime // Punishment is almost as good – and with more mana, a Crime // Punishment can kill more expensive stuff. Right now I have a Glare in the board in place of C // P, but that will probably revert. C // P is better in many instances – and certainly better than the very conditional Culling Sun. Once in a blue moon I wish I had one of these in the sideboard. For example, when an opponent resolved a Blazing Archon, I really wanted to Pillory it, then just sit there and watch him lose slowly. However, Mortify or Putrefy do everything this can do (except the slow lifeloss) with no chance os a Disenchant bringing the creature back. I just can’t see this over the better cards already in the deck. The Enforcer is the one card that really scares me with this deck. It only dies to Wrath and Damnation, and it stops Teneb completely. I hate playing against it, but I have not quite convinced myself that it belongs in the sideboard. However, the more I think about it, and the more common Tendrils-based decks become, the more likely I am to squeeze an Enforcer into the sideboard. Mystic Enforcer has another advantage: by the time you want to search for him, you probably already have threshold, and probably can Wish and cast him, all on the same turn. She’s great, and all that, but you cannot tutor for single colored cards. Besides, you can play your opponents’ copies. Just Wrath, then Crime // Punishment them over to your team. If my sideboard was larger, I think the first cards back in would be the fourth Crime // Punishment and the Leylines. After that I would fit another Mortify. I am even considering replacing the Putrefy with Mortify. I have found almost no artifacts I really need to kill in the past month, but I have found enchantments. Putrefy does have one advantage over Mortify as a Wish target: Wishing for Putrefy and casting it does not require double white mana, which can be tricky. Right now, I have the cards to run many of the Tier One Standard decks. I run this one. I should be practicing for the block PTQs. Instead, I’m playing this deck. It is just plain fun. About the only downside is the cost, but if you are planning on playing constructed in the future, you are going to need the Wraths, Damnations and dual lands sometime, anyway. Think of them as an investment – and other than that, the deck is reasonably cheap. One quick question. Why is it 61 cards? Wow that is a pretty good compliment. I must agree though Pete is the man and he knows his stuff. Him and his wife are both judges and top notch people in general.